Healing The Land is volume 3 of a series of books by Ray Simpson, titled The Celtic Prayer Book. The book focuses on Celtic Christian tradition and highlights the importance of constant renewal and its sense of the unity of all creation. The book harnesses the power of prayer and gives recommendations for using prayer to re-discover God's healing nature. Celtic Prayer Book Volume 3: Healing The Land by Ray Simpson was published by Kevin Mayhew in April 2004 and is our 17049th best seller. 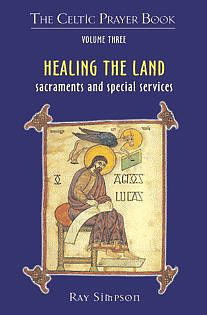 The ISBN for Celtic Prayer Book Volume 3: Healing The Land is 9781844171095. Be the first to review Celtic Prayer Book Volume 3: Healing The Land! Got a question? No problem! Just click here to ask us about Celtic Prayer Book Volume 3: Healing The Land.